There are 19 Memory Care Facilities in the Shawnee area, with 1 in Shawnee and 18 nearby. The average cost of memory care in Shawnee is $5,900 per month. This is higher than the national median of $4,650. Cheaper nearby regions include Overland Park with an average starting cost of $5,259. To help you with your search, browse the 59 reviews below for memory care facilities in Shawnee. On average, consumers rate memory care in Shawnee 4.6 out of 5 stars. Better rated regions include Kansas City with an average rating of 5.0 out of 5 stars. Caring.com has helped thousands of families find high-quality senior care. To speak with one of our Family Advisors about memory care options and costs in Shawnee, call (855) 863-8283. Shawnee, Kansas, has been named one of the nation's best places to live according to Money Magazine. This Kansas City suburb has a population of 65,513, including 8,000 senior citizens and some 860 adults with dementia, Huntington's disease and Alzheimer's disease and other cognitive and neurological disorders. 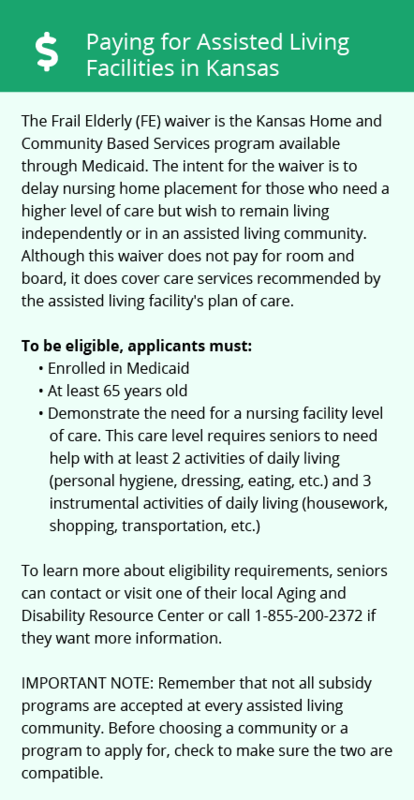 Unlike some states, Kansas doesn't have specific dementia care regulations. Properties that provide memory care must follow the same regulations as all assisted living facilities. Additionally, they must have specialized employee training programs and exit protocols. Shawnee residents can choose from more than a dozen assisted living facilities that provide memory care services. Shawnee, Kansas, is home to several world-class medical facilities, including those specializing in brain health and dementia care, such as the AdventHealth Shawnee Mission Neurology Care department and the University of Kansas Alzheimer's Disease Center, in the event of medical emergencies or illness. In general, seniors are more susceptible to particulates and other pollutants, even those who don't have asthma or COPD. Fortunately, the air in Johnson County has received an A rating from the American Lung Association for its low concentration of ozone and particulates. The cost of living in Shawnee is just above the national average and moderately higher than the state average. Although residents pay a little bit more for housing, healthcare and miscellaneous expenses, the cost of groceries, utilities and transportation is slightly less than average, which can benefit family decision makers who must consider the affordability of memory care and related services. Seniors in Shawnee can feel comfortable due to the city's safety track record. With one being the safest and 100 being with most dangerous, Shawnee has a property crime score of 28.4 and a violent crime score of 12.1 compared to the national average of 38.1 and 31.1 respectively. Still, memory care facilities should have adequate safety controls to protect residents at all times. Memory Care costs in Shawnee start around $5,595 per month on average, while the nationwide average cost of memory care is $4,799 per month. It’s important to note that memory care rates in Shawnee and the surrounding suburbs can vary widely based on factors such as location, the level of care needed, apartment size and the types of amenities offered at each community. Shawnee and the surrounding area are home to numerous government agencies and non-profit organizations offering help for seniors searching for or currently residing in an assisted living community. These organizations can also provide assistance in a number of other eldercare services such as geriatric care management, elder law advice, estate planning, finding home care and health and wellness programs. To see a list of free memory care resources in Shawnee, please visit our Assisted Living in Kansas page. 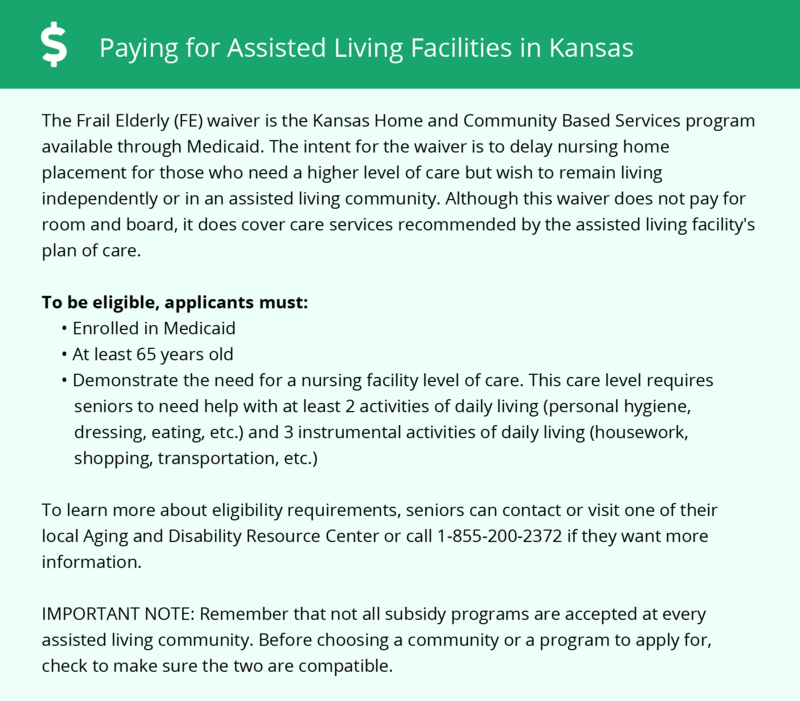 Shawnee-area assisted living communities must adhere to the comprehensive set of state laws and regulations that all assisted living communities in Kansas are required to follow. Visit our Memory Care in Kansas page for more information about these laws.